The X PrizeFoundation is seeking public comment on draft rules for a lunar lander contestset for later this year. 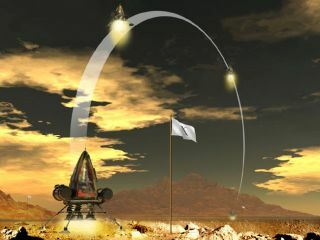 The $2million Lunar Lander Challenge, part of NASA’s Centennial Challengesprogram to encourage development of low-cost space technologies, offers cashprizes for the successful flight of a vertical launch and landing vehicle. “Thepurpose of public comment is strictly for support,” X Prize Foundation spokespersonIan Murphy told SPACE.com, adding that final rules will be releasedbased on feedback on the draft set. The X PrizeFoundation has a successful track record when it comes to space-themedcompetitions. The group led the successful $10 million Ansari XPrize competition – which challenged teams to build and launch apiloted suborbital spacecraft twice in two weeks – then established plansfor the annual XPrize Cup. SpaceShipOne,a rocketship built by Mojave, California’s Scaled Composites andaerospace veteran Burt Rutan, wonthe X Prize purse. Accordingto draft rules for the lunar lander contest, competitors will be challenged tobuild a vehicle capable of launching vertically, travel a distance of 328 to656 feet (100 to 200 meters) horizontally, and then land at a designated site.A return trip would then occur between 5 minutes and 30 minutes later. The contestis expected to be divided into two levels, one for flat terrain, and the otherto resemble the lunar surface – with other cash prize amounts based onlevel difficulty and finish results. For Level 1contests, vehicles must fly higher than 328 feet (100 meters) for about 90 seconds andland on flat terrain no more than 10 meters from a target. Level 2 competitionswill feature the mock lunar surface and a minimum flight time of 180 seconds,according to the draft rules. Commentsare sought by March 1 with initial sign-ups slated for May 15, according todraft rules, though Murphy added that the comment period could be extended to30 days. NASA worked withthe X Prize Foundation to develop its Centennial Challenges program,ultimately partneringin the Lunar Lander Challenge and the Suborbital Payload Challenge. Thefoundation’s call for comments follows a similar action by the CentennialChallenges program earlier this month, when NASA announced preliminary rulesfor sixnew contests that ranged from power source demonstrations to space-basedfuel depot tests. Comments onthe draft rules set for the Lunar Lander Challenge can be sent via e-mail tothe X Prize Foundation via e-mail at: LLComment@xprize.org.